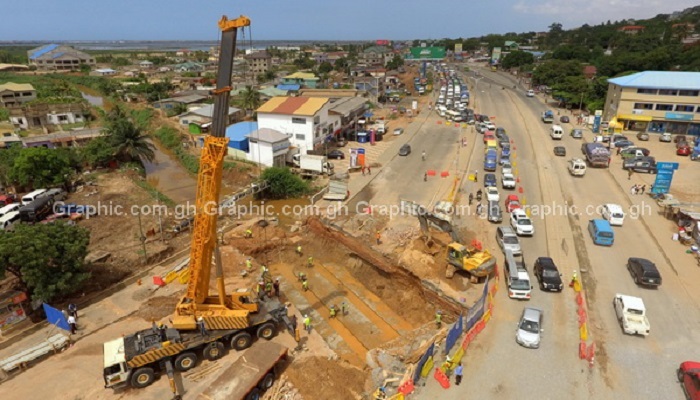 The Mallam Junction section of the Accra-Kasoa road that was closed to vehicular traffic, to make way for work on the Mallam Junction drainage project, will be opened to traffic by Saturday, June 2. This will bring great relief to motorists who ply the road who have been under intense stress since their routes were diverted for the GAMA Sanitation project to take effect. A Sanitation Engineer of the GAMA Sanitation and Water Project, Mr Gabriel Engman, told the Daily Graphic in Accra last Tuesday that the portion of the road which were closed, to make way for the construction of the drain, would be opened to the public on Saturday. “The project will be completed ahead of schedule because it was to be done in about 50 days and opened to traffic, but we have finished the first two phases and are half-way through the last phase in just 29 days. “What we are focused on now is to finish the work ahead of schedule and that is way on course because we have done barely a month but more than 75 percent of the work has been done already,” he said. Road users have suffered inconveniences and frustration due to the worsening vehicular traffic, resulting from the project for the past few weeks. For instance, last Monday, many of the road users who started the journey from Kasoa and its environs around 4 a.m. with the hope to beating the usual morning traffic, reportedly, were caught up in a gridlock for about three hours. The situation led to many workers reporting late to their places of work, while market women, who lived up to the early bird catches the worm mantra, had their hopes dashed. Mr Engman empathised with the motoring public and called on them to “bear with us as we put finishing touches to the project. We anticipated that there will be traffic jams when the construction work began but the intermittent rains affected the roads and also slowed down the movement of vehicles, resulting in the bad situation we are witnessing,” he added. Work on the 500-metre double cell culvert drain at Mallam Junction began on Monday, April 30, 2017 and was expected to be completed in 50 days. The GH¢6 million Mallam drain is among some priority drains that have been earmarked for re-engineering under the Greater Accra Metropolitan Area (GAMA) sanitation project that started in 2015 with a US$150 million funding support from the World Bank. As part of the arrangements, traffic flow from Awoshie and Kwashieman that connects to Mallam, Weija and Kasoa, has been diverted. Traffic from the Odorkor-Mallam, as well as the Kasoa-Odorkor roads, has also been diverted to alternative routes, to ensure that work is not interrupted. The diversions have created some inconveniences for road users, as they have to stay longer on the road before they get to their destinations.